A severe food shortage is on its way, according to well-regarded investor Jim Rogers. Food inventories are the lowest in decades and "[m]any farmers cannot get loans to buy fertilizer now, even though we have big shortages developing," Rogers said on CNBC.For investors, that could mean a buying opportunity in commodities, in particular coffee and cotton, Rogers said. In fact, he says commodities are a much better buying opportunity than stocks right now. For the rest of us, a food shortage could mean skyrocketing food prices. "Sometime in the next few years, we're going to have very serious shortages of food everywhere in the world and prices are going to go through the roof," he said. Food prices have certainly been on a wild ride recently. Over the past year, the iPath Dow Jones-AIG sugar ETF (SGG) has almost doubled in value and, in recent years, other commodities, like corn and coffee, have also shot up. Among the potential culprits are escalating oil prices, a rising standard of living in China and India, global warming, and dark prophesies by analysts about the pending food crisis. Some have even gone so far as to suggest that the government is covering up a pending disaster of near-biblical proportions. The truth is a bit more complex and a lot less dire. In the case of sugar, the 2009 price increase was due to a few very controllable factors that decreased worldwide supply and pushed prices higher. India, a major sugar producer, cut cultivation after prices dropped in 2007 and 2008. Meanwhile, the world's top producer, Brazil, diverted sugar cane into ethanol production, further reducing worldwide supply. In America, this problem was exacerbated by the powerful sugar beet lobby, whose massive tariffs keep domestic sugar prices at roughly two to three times the global market rate. Similar manipulations have occurred in the price of corn. The crop is used in a slew of products: feed for animals, common sweeteners, a large array of additives that find their way into thousands of foods and, more recently, ethanol. In 2008, the popularity of the crop was starting to look like a problem, as the cost of futures shot up to roughly four times 2006's prices, and it appeared as if a corn famine was just around the corner. But corn prices have come back to Earth.On Tuesday, the U.S. Department of Agriculture estimated that 2009's corn harvest broke records, and March corn contracts are trading at less than $4, half of what they were getting two years ago. While ethanol production is still elevating corn prices, a few simple policy changes -- including a move to use cellulose, sweet potatoes or trash to make ethanol -- could pull the rug out from under corn, sending prices into a nosedive. While today's warnings of food shortages are a very real possibility, relatively minor changes in policy and practices could quickly make this problem disappear. According to Rafael Goldberg, CEO of Interrupcion Fair Trade, a non-profit dedicated to fair trade practices: "The main way to correct rising food prices is to reconsider our food policy." 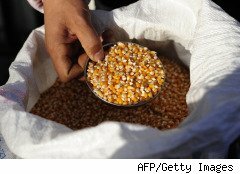 "If farmers were no longer incentivized to feed cows corn, and if we could derail our cannibalistic policy choices that couple food and fuel, we could get a clue as to the actual relationship between food supply and demand," he said, referring to the inflation in corn and soybean prices over the last few years. Given the degree to which policy shapes food prices, and the extent to which rising costs often cause demand to drop, Jim Rogers' prediction of "serious food shortages" seems alarmist, to say the least. His advice might be worthwhile for a short term gain as consumers panic, but it seems likely that, over the long-term, food security should remain fairly consistent.